There are certain things in life that instantly boost my mood: the first bite of a red velvet cupcake, making it through all the green lights on my way to work, and … nail art. Whether it’s on my own nails, or somebody else’s, nail art has this delightful way of lifting my spirits. So for our latest installment of awesome nail art, my fellow Beauty Riot editors and I have dug up some jaw-droppingly cool nail designs that you’ll “ooh” and “ah” over. Click here to see our cool nail art roundup. 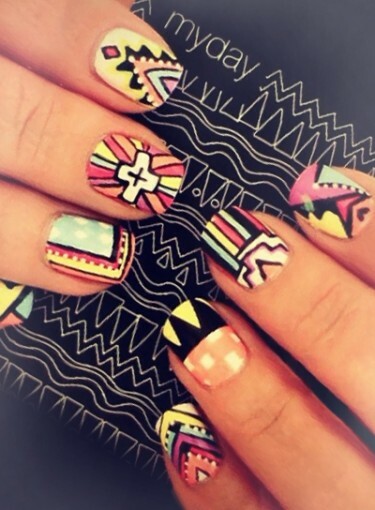 With so much awesome nail art to choose from, it’s hard to believe this trend was once considered borderline tacky. It used to be all about cheap rhinestones and acrylics, but now the focus is on really clever, artistic designs. That doesn’t mean you have to have Picasso-like painting skills. Most of these nail design ideas are actually pretty easy to achieve and don’t require a super steady hand. Even if they do feel on the advanced side, you can always get some great inspiration and ideas from these creative nail designs. After all, “Nail art is just for fun, and everybody needs more fun in their life,” says celebrity nail artist Fleury Rose. To learn the tips and tricks of the nail art trade, I chatted with Rose and another celebrity nail artist, Skyy Hadley, and they both gave me the scoop on everything from must-have tools to perfect polish suggestions. But before we get started with our roundup, I have to warn you: this nail art stuff is pretty addictive. Once you get the hang of it, you’ll want more … and more. And we’re not gonna stop you. Need your nail art fix now? Keep clicking to get your creative juices flowing with our awesome nail art roundup.